It was the 4h of July and I was still asleep. I heard something drop on my air conditioner or in my air conditioner. It was a small noise but it was not a noise I had ever heard. Shortly after the plunk, I heard the cooo-rooo-hoooooo of a Mourning Dove. 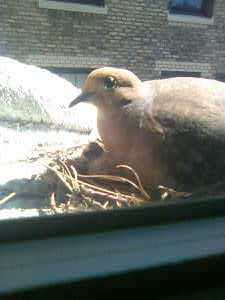 I went quickly to the window and raised the shade to discover a street smart and tough looking Mourning Dove staring me down. Hmmmm, I thought, "Now that’s strange, they usually fly away when I open the shade." I took a closer look and discovered that this poor dove had dropped an egg on the vent on the top of my air conditioner. 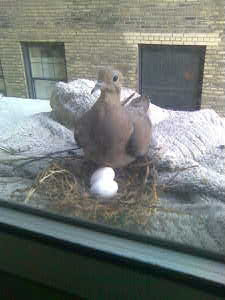 Young Inexperienced Dove Asks, "What Do I Do With These?" Something inherently seemed out of order but I wasn’t exactly sure what, and I am not exactly a bird expert, so I called the Audubon Society and the Wildlife Bird Volunteers. Rita, the kind bird lady who answered the Bird Hotline informed me that Lovey Dovey (that’s what I named her) was a newbie at the whole egg routine. She politely asked me if I saw Lovey’s mate. Well now, I thought, "How would I know what the husband would look like? Do they wear wedding rings? Would he have a mustache? How would I know?" Then Rita asked me if Lovey had a nest for her egg. No was the answer. The outlook was grim and Rita was quick to tell me that she sounded like an inexperienced dove who really didn’t quite know the drill in the whole egg routine. I hung up the phone somewhat devastated. From what Rita said, Lovey was a totally unfit mother and the egg didn’t have a nest or a father or for that matter much of a chance to make it. I refused to receive such a gloomy prophecy for Lovey’s egg and I prayed. I thanked God that quickly a husband would come and that a nest would be built. I went to the kitchen to make some lunch and, lo and behold upon my return, there stood a tall dark and handsome mate with twigs in his mouth and within the next 10 hours the two built a lovely little nest for the egg. I sat in sheer amazement at the goodness of God and the answer to my prayer. The little egg had hope and sure enough all this on the 4th of July. Seemed fitting. I soon came to discover, however, that I could not possibly run my air conditioner without the very likely chance of disrupting the egg’s development. So, now it was 7:30 PM on the 4th of July and I was hot. I ran to my laptop and did a quick search on where to buy an air conditioner on July 4th in New York City. No help. My next thought was that K Mart never closes. I ran over to Astor Place as a very sweaty New Yorker and purchased a big air conditioner to put in another window and bought a rolling cart to haul it home. 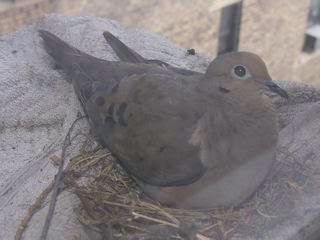 Lovey sits on her eggs all day patiently awaiting the birth of her babies (eggs hatch in 14-16 days). It been a lesson I wasn’t quite expecting. First is the lesson of Patience. This dove sits there all day long and never moves. The sun bares down on her, the wind blows, the rain pours and she never budges until Mr. Dovey comes to relieve her. She is truly a patient little being, never seeming upset, bored, or overwhelmed. I am a tad ashamed to say that I am not quite sure which one is Lovey Dovey and which one is Mr. Dovey, but I do know there’s two. I am told that the male spends about 8 hours a day on the nest, so it sounds like an equal opportunity project. How funny these two are, getting the whole thing backward. 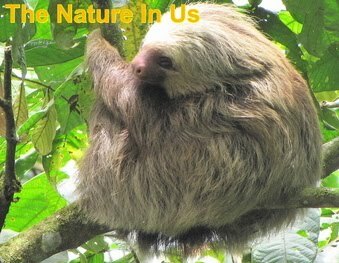 Just like any crazy New York couple might do, they made good when the male showed up, twig in mouth, and began to build. Life has its ups and downs. Along with life comes death and it's all part of the process. The two eggs hatched with two wee littles one that I named Umbirdo and Umbirda. Unfortunately one of the siblings didn't make it. Being witness to this was very upsetting, but I know that nature has its reasons. Better young than older if it was a deformed bird in some way. Again, Lovey Dovey and Mr. Dovey seemed to take things in stride much better than I was. The lessons that nature can teach us ... even in a New York City apartment building. I was scheduled for vacation time and left before the whole story finished, but my friend kept an eye on things and while I was gone, the family "flew the coop" to continue on with the process of life. There's so much to learn if we keep the eyes of our heart open to life and all Creation in it. The photos and article are copyrighted by Shelley Goldberg.